Christmas and fireplace mantels are a tight twosome. With or without the traditional hung stockings, you can make your mantel the nostalgic and charming focal point of the room. Because nostalgia and charm resonate with home buyers. Here’s what I did to dress for the season a driftwood mantel on a rugged stone fireplace that needs to be the focal point of this family room. Your idea might be a particular color scheme or a specific topic. When it comes to colors and style, at holiday time you have an excuse to go glitzy or dramatic. For example, metallics and saturated colors that you might normally avoid while staging your home, are perfect for holiday décor. On the other hand, monotone color schemes and minimalistic styling can be smashingly elegant. It’s one way to simplify your life, because putting decorations up at the start of the season takes time, and then taking them down and storing them away takes time again in January. Keep it simple. For this mantel I decided to concentrate on traditional reds and greens for my color theme. My topic theme was nature, because this house sits on a densely wooded lot. In fact, all the greenery came from the property. Some examples of specific topics would be themes like antique toys, Mercury glass, shabby chic angel ornaments, ceramic animals, or the classic nativity crèche. If your home is for sale, you might want to choose a theme that accentuates what's special about the house or the room. the colors keep it simple. 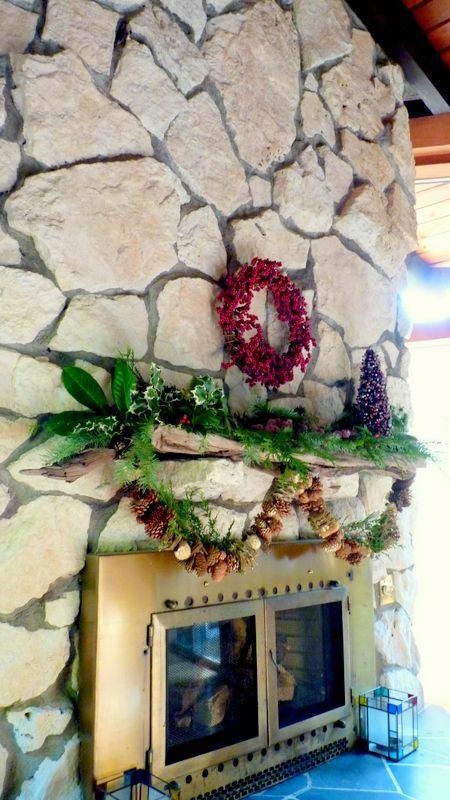 If you are undecided about an idea to tie your mantel decorations together, begin with step two. Shop your home and see what elements you have available. Use your imagination to repurpose items. An inverted vase can become a pedestal. A necklace can become a swag. Books can become wrapped gifts. 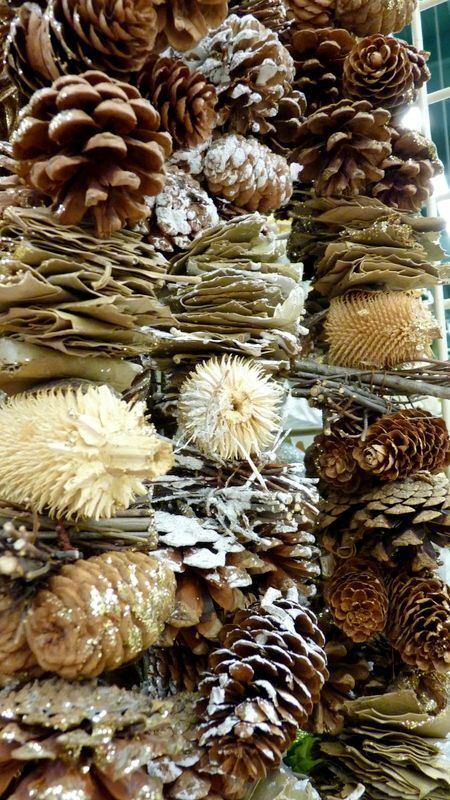 Don’t ignore what’s growing in your vicinity (pinecones, greenery, logs, seed pods, bare branches…) as well as what you’ve tucked away in closets and other storage areas like the garage, garden shed or storage building. Remember that paint will transform almost anything into what your color scheme calls for. That old plastic flower pot can look like granite, and those thrift store vases can look like silver or gold once they are spray painted. This step isn’t always necessary. You may have all the things you need on hand. And if you are like many crafters or budget decorators, you’ve already scooped up Christmas decorations at summer garage sales and last year’s post-holiday sales. Your materials should include some items with different textures, sizes, and materials. For example, don’t make everything transparent or everything solid. Instead, include some of both. Include dull surfaces and glossy surfaces, large forms and smaller shapes, some round objects and some hard edge objects. It’s best to begin with a clean slate. So, remove whatever is on the mantel and give yourself room to work in front of the fireplace. Spread out the possible objects you’ve collected. Next, place one large object as the background for the mantel grouping. You will be surprised what a difference this makes. It gets you off to a great start. 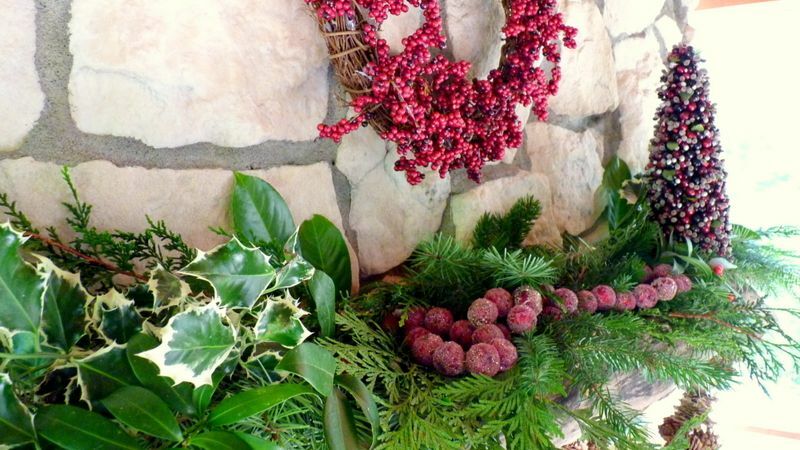 I hung a round wreath of artificial red berries on the chimney breast to get my arrangement going. You could use a mirror, an empty frame, a painting like I did for the autumn mantel I blogged about, or something vintage like shutters or a door. I often begin by hanging or draping something the length of the mantel. This is another way of unifying and balancing the grouping that’s to come. On the driftwood mantel, I strung the garland that I purchased at Michaels. I fell for it the moment I saw it. I adore the warm colors and woodsy feel to it. I placed one item – the red berry tree – on one end of the mantel and some oversized greenery at the opposite end. Now I had some balance and I could fill in with smaller items. Plenty of greenery softened the look of the stone and unified my arrangement. 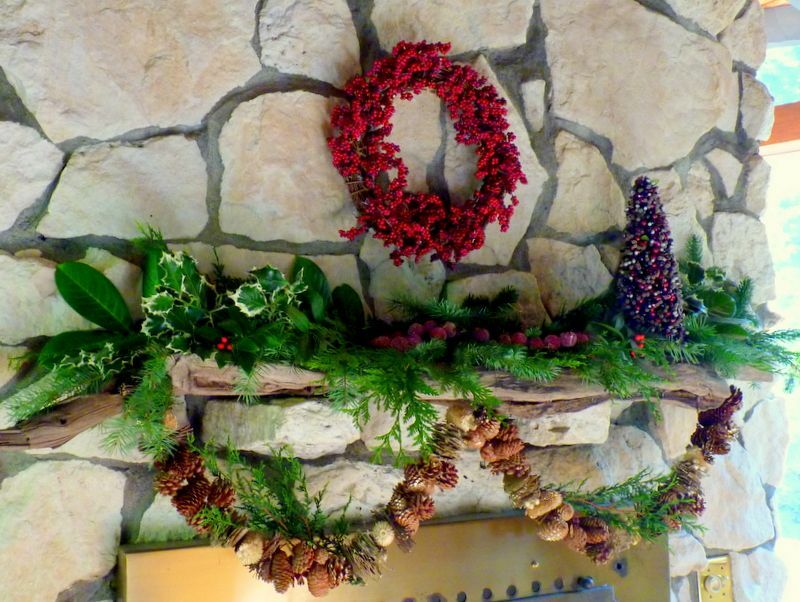 I added a string of glistening red berries to the center of the mantel and some more springs of greenery that included real red berries. I wasn’t about to complicate things with too many colors since I was going for tradition and natural simplicity. 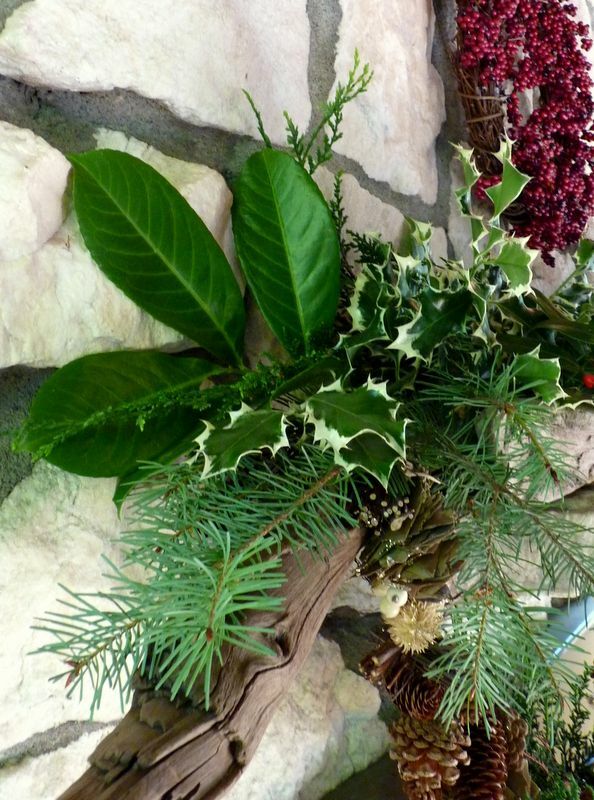 To tie the brown garland into the green arrangements above it, I wove some evergreen sprigs into the chain. That’s all it took to finish the entire mantel. Evergreen sprigs tucked into the swag and more red berries were part of the finishing touches. In the staged home, too many details will draw attention to the mantel itself, instead of the mantel calling attention to your selling point – the fireplace. Keeping decorations simple saves time, money and stress. When your home is on the market, you need easy and quick ways to add festive touches. I write about mantel décor -- as well as what else you need to know about home staging -- in my $4.99 eBook, DIY Home Staging Tips to Sell Your Home Fast and For Top Dollar. You can download the book now and start learning how to attract buyers to your property.